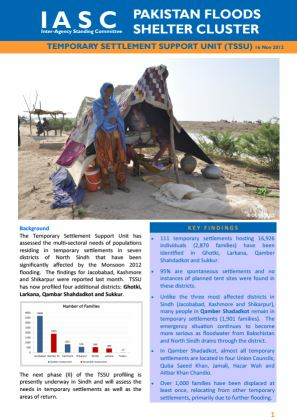 A consistent trend to return to areas of origin is observed; however, 6,151 families remained displaced in Sindh and Balochistan, with inaccessible place of origin cited as the main impediment to return (82%), and majority of IDPs fearing they will remain displaced for at least 1 to 3 months. 111 temporary settlements hosting 16,926 individuals (2,870 families) have been identified in Ghotki, Larkana, Qamber Shahdadkot and Sukkur. 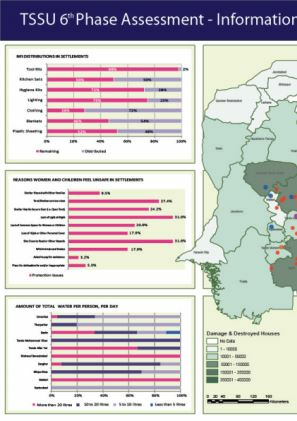 95% are spontaneous settlements and no instances of planned tent sites were found in these districts. 201 temporary settlements hosting 32,269 individuals have been assessed in Jacobabad, Kashmore and Shikarpur. Settlements lack proper structure; 78% are spontaneous settlements. This dashboard displays information as of 8 March 2012 by cluster consisting of a map and data represented in graphs. 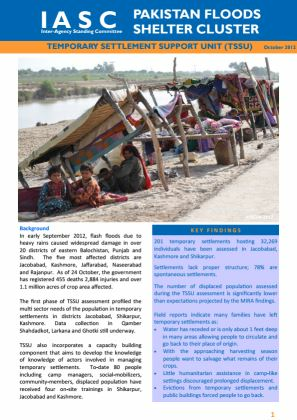 In Umerkot district TSSU recorded 44 temporary settlements (TS) with 1,073 families (5,841 individuals). All 44 settlements are spontaneous, with no camp management or site management agency. 44% TSs indicate they will stay 1-3 months, 33% indicate 3 months or more. 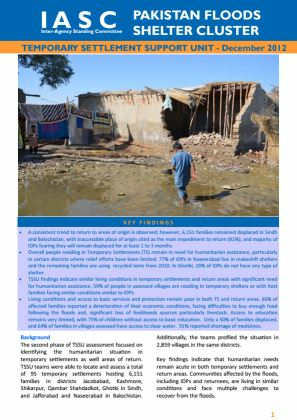 TSSU recorded nine temporary settlements (TS) with 189 families (1,020 individuals). All nine settlements are spontaneous without camp management or site management agency. Four TSs indicate they will stay one-three months, five indicate that they will remain for three or more months. This dashboard displays information as of 2 February 2012 by cluster consisting of a map and data represented in graphs. 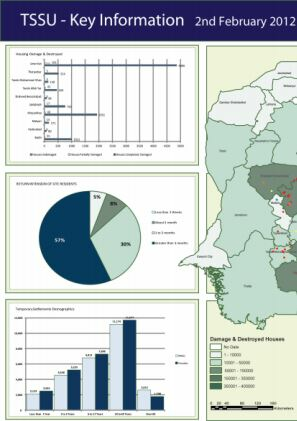 This dashboard displays key TSSU information as of 2 February 2012 consisting of a map and data represented in graphs. 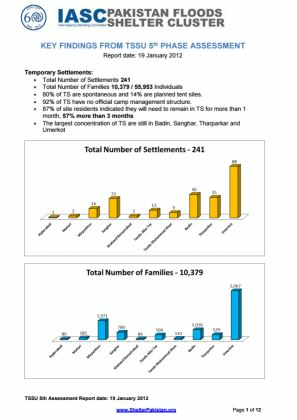 According to the fifth phase of the TSSU assessment, there are 241 settlements with 10,379 families (55,953 individuals). 80% of all temporary settlements (TS) are spontaneous and 14% are planned tent sites. 92% of TSs have no official camp management structure. 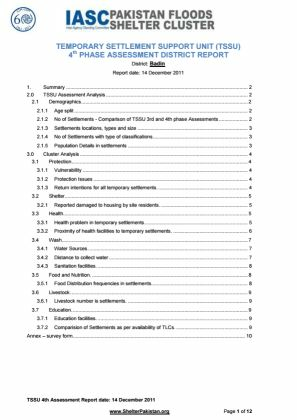 This report contains the analysis and findings of the Temporary Settlement Support Unit (TSSU) assessment. 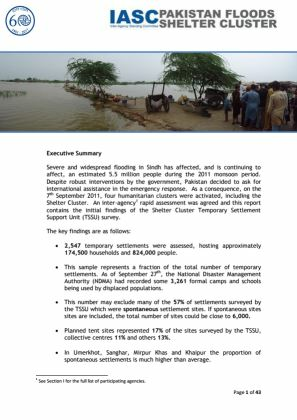 During the course of this survey, teams visited 2,572 temporary settlements. It was discovered that 1,430 settlements were closed while 1,142 settlements remain open. 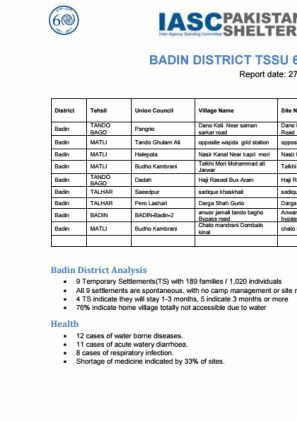 This report contains the analysis and findings of the Temporary Settlement Support Unit (TSSU) assessment of District Badin. 386 temporary settlements were visited. 226 settlements were closed. 160 settlements remain open. 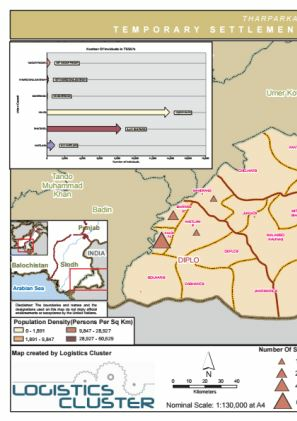 This map displays number and locations of temporary settlements in Matiari district as of 14 December 2011 (Logistics cluster). 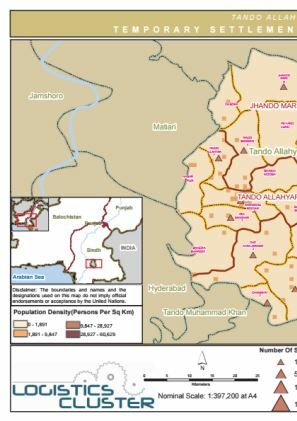 This map displays number and locations of temporary settlements in Tando Allahyar district as of 14 December 2011 (Logistics cluster). 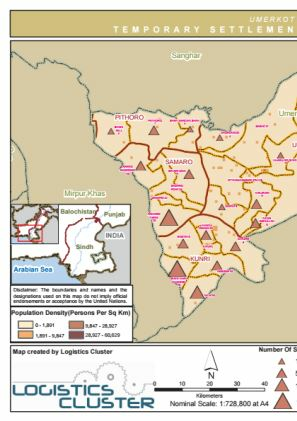 This map displays number and locations of temporary settlements in Tharparkar district as of 14 December 2011 (Logistics cluster). 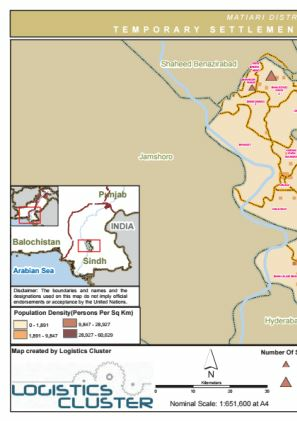 This map displays number and locations of temporary settlements in Umerkot district as of 14 December 2011 (Logistics cluster). 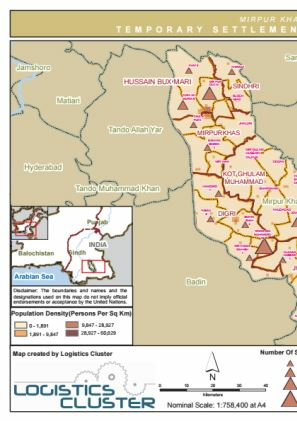 This map displays number and locations of temporary settlements in Mirpur district as of 14 December 2011 (Logistics cluster). 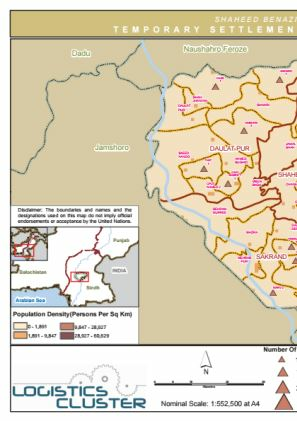 This map displays number and locations of temporary settlements in Sanghar district as of 14 December 2011 (Logistics cluster). 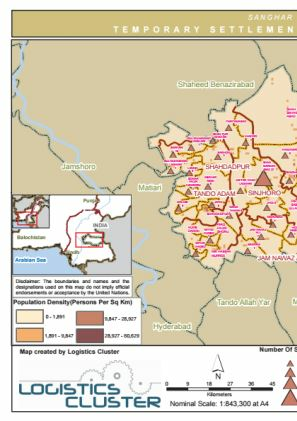 This map displays number and locations of temporary settlements in Shaheed Benazirabad district as of 14 December 2011 (Logistics cluster). 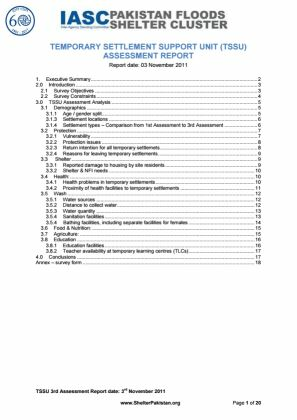 This report contains the analysis and findings of the Temporary Settlement Support Unit (TSSU) assessment. During the course of this survey, 2,572 temporary settlements were assessed, hosting approximately 86,638 households and 454,400 people. 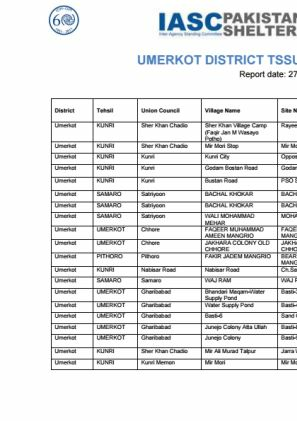 This is a list of 300 TSSU prioritized settlements based on number of families detailing unique site ID, district, Tehsil (sub-districts), Khoski, site name and number of families. 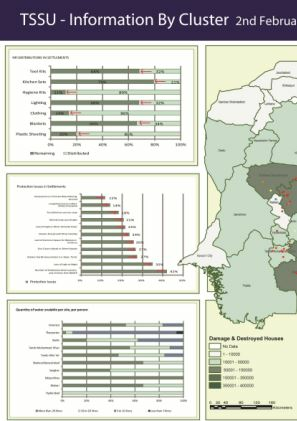 2,547 temporary settlements were assessed, hosting approximately 174,500 households and 824,000 people. 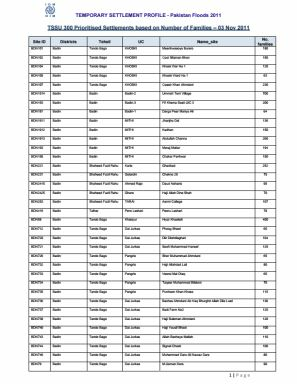 This sample represents a fraction of the total number of temporary settlements.